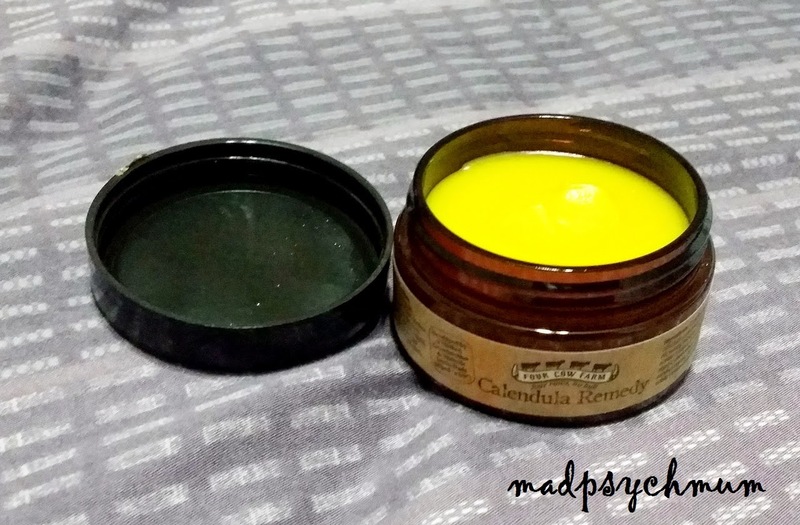 I'm not really big on organic products as I feel it's not worth the time and money to get them since it's almost impossible to live 100% organic in Singapore. However, the folks at Four Cow Farm swore by their products and told me that their baby wash could do more than just wash a baby, it could be a face wash or vegetable detergent too. That got me very intrigued because you know how much I like multi-purpose products. "Sure or not?" I thought. I was going to give them a try to find out. 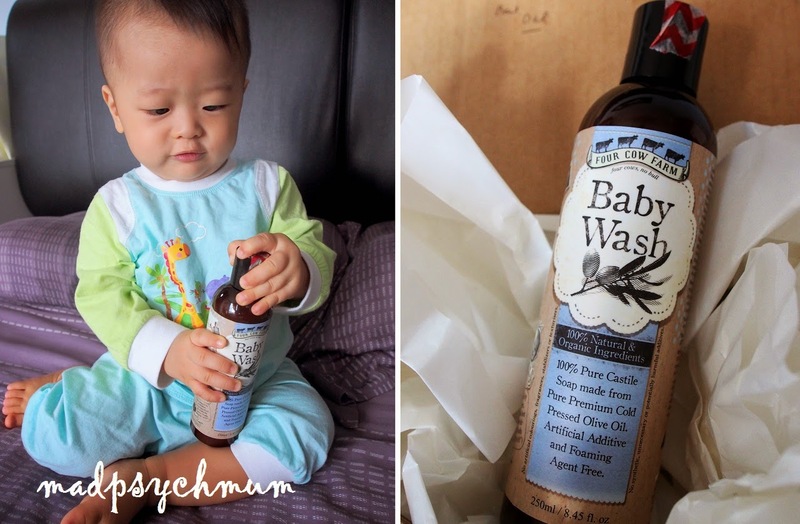 I was keen to try the Baby Wash because not only can it be used to bathe the baby, it can also be used as a facial wash for adults, laundry detergent, bottle wash and even a floor cleaner! Amazing. I'm bringing this for my next overseas trip so that both Baby Boy and I can use it and I don't have to bring so many bottles. 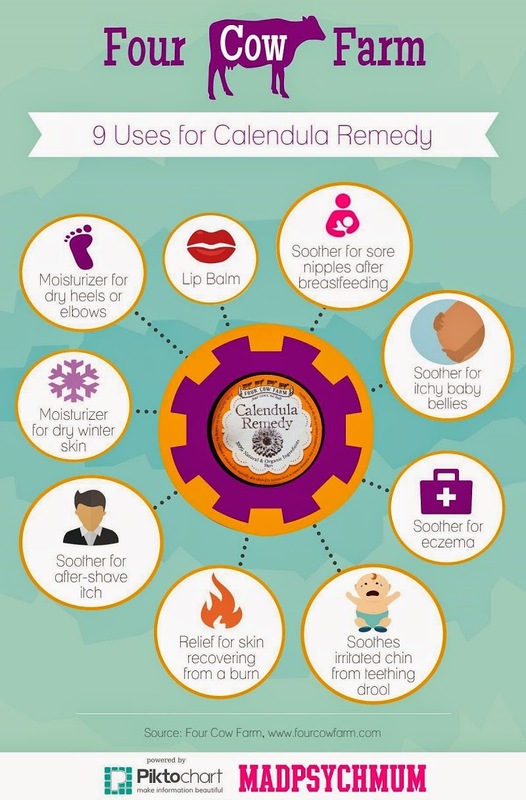 I've previously used the Calendula Remedy for my girl so I know that it is good. 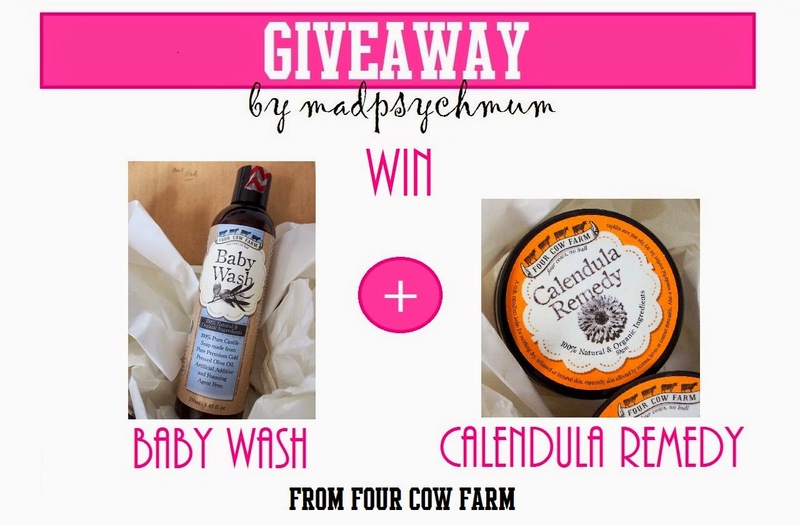 Thanks to our generous sponsors, we are giving away 1 Baby Wash 250ml and 1 Calendula Remedy 50g to FOUR lucky winners! a) This giveaway ends on 31st March 2015 (Tue) and is only open to readers living in Singapore. b) Participants must complete the entries above and enter them into Rafflecopter in order to qualify. Other entries entered into Rafflecopter must also be completed (I do check!). Incomplete entries will be disqualified without notice. P.S: Enjoy 10% discount off at Four Cow Farm's online store by simply entering this discount code: "MADPSYCHMUM10" (valid from 20 March 2015 to 20 April 2015). Disclosure: Complimentary products were received from Four Cow Farm for the purposes of this review and giveaway. No monetary compensation was received; all opinions are my own.